Depending on where you live in the U.S. you can expect the orioles to return from mid-April in the south to nearing the end of May in the North but it’s important to remember that with Oriole’s, timing is everything! Be sure to have your oriole bird feeder hung in easy view and filled with nectar, oranges, and jelly hung outside a couple of weeks before they are due to arrive. Orioles are stunning birds and are much anticipated by bird lovers. Like other species in the bird family, the males are brighter but in Orioles, the females are gorgeous as well. There are nine species of orioles in the U.S. however only 5 or common enough that you will will probably see them, the others, well you’ll have to go looking for them. And what a nest they make! Many orioles find tall deciduous trees, where they carefully weave together plant fiber and sometimes yarn or string if they can find it, to make their nests. Some orioles will take up to 12 days to construct their pendulous sac-shaped nests which they build on the ends of thin branches. This placement keeps the eggs and babies relatively safe from climbing predators and other nest robbers. Remember this, your chance to see these beautiful orange birds doesn’t last long, because most start to migrate south in August. It’s a thrill to see these beautiful birds for most bird lovers and your chances of seeing them will be lengthened by offering an abundance of food. These birds arrive hungry and will move on quickly if no food is available. Whether you spot them for just a day or are lucky enough to have them visit your yard most of the summer, they are one of spring’s greatest bird treasures. Begin 2 weeks earlier than you expect Orioles to arrive in your area. Your best chance of attracting orioles is when they first arrive in early spring. Use the same nectar recipe for orioles as you do for hummingbirds-four parts boiled water to one part sugar. Keep nectar fresh, change every 2-3 days, and don’t use food coloring. These birds are attracted to the color orange, so they will love this specifically designed feeder for orioles. When placing the oriole feeder in your yard, think like a bird. Instead of hiding the feeder under an awning or tree, put it out in the open so the birds can see it while flying overhead. If you have a large yard offer more than one feeder. Hang your feeder near a birdbath. If your bath has a mister or dripper, even better. Orioles love the sight and sound of moving water! Put out yarn and string. 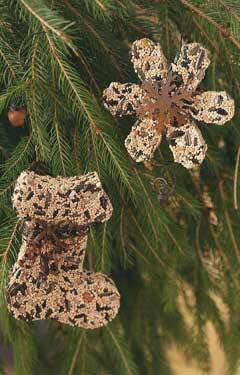 Hang small pieces from tree branches. 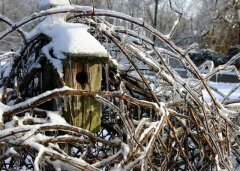 Orioles and other backyard songbirds will use it for their nests. Bird Photography isn’t just for pro’s. With a digital, traditional, or even a video camera and a little patience, you can shoot great bird images in your own backyard. Spend thousands of dollars on photography equipment. Travel to expensive faraway places. Wade through muddy swamps, fight off mosquitoes, and sweat profusely in the humidity to get that “perfect shot”. If you like option “D”, they’re going to love my six step plan for snapping great bird photos. This method has given me professional quality photographs for relatively little money and work. All it takes is a little practice and patience. 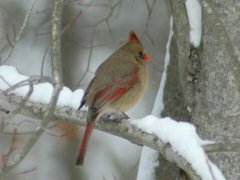 Chances are, you already have plenty of interesting backyard birds in your area, such as Cardinals, Blue Jays, Black Capped Chickadees, Purple Finches, Song Sparrows, Dark Eyed Juncos, Spotted Towhees and more. So keep reading, and soon you’ll be able to capture a bird photo you’ll be just as proud of as the pros. And the best part is you don’t even have to leave your backyard! Put up a bird feeder. Almost any kind will due as long as the birds can get the food. My personal favorite for this activity is a platform feeder. Although it doesn’t have a lot of pizzazz, it does the trick. (its’ basically a plane horizontal stand with low walls on the sides to contain the seed). You can place this type of feeder anywhere, fill it with any kind of seed and use it to attract any type of bird. Fill the feeder with tempting food. There are many kinds of birdseed, and some are better than others. I prefer Black Oil sunflower seeds because it tends to attract the most birds. You could also try Millet for sparrows, peanuts to attract Blue Jays, and thistle for finches. 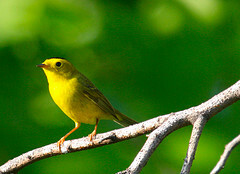 Try a few different offerings in advance to see what kind of birds you will attract. Put your feeding station in a good location for photography. If you don’t have a perfect place, don’t panic. Find the best spot you can, giving highest priority to areas with good light. As a general rule, try to follow these guidelines. • Your best bet is to find a spot that gets early morning sun, which will give you a nice lighting. • Place the feeder near cover, such as bush’s, trees and other objects so the birds have a spot to perch and the background in the photo looks natural. • It’s important NOT to put the feeder in the shade. This will cast shadows on the birds that will show up in your photos. 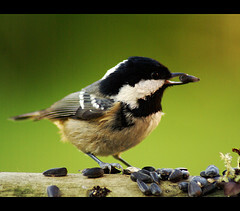 • Position the feeder near a window, so you can easily capture the moments from inside your home. Place perches strategically around the feeder. To get nice, clean shots of birds in their natural environment, you’ll probably have to “create” perches. 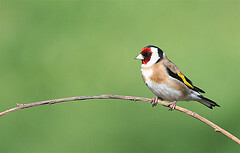 Birds like to land on branches near a feeder before eating to make sure the coast is clear. You might want to experiment a little to see which perch works best and where, but I like a plain dead branch stuck into the ground near the feeder. It’s sturdy, doesn’t wilt and it isn’t complicated. Mix it up, though. You don’t want all of your photos to look the same, so give your feathered friends plenty of perches to choose from. Find a cover for yourself. You can devise many ways to hide yourself 10 to 15 feet away from your birds. This distance should be perfect for shooting your photos. However, depending on your camera, you can move in a little closer if you don’t have the ability to zoom in. If you have somewhere inside the house that you can shoot your photos from an open window that’s close to your feeder, that’s perfect. If not, consider putting up a tent in your yard and shoot from inside the tent. Another option is to build a temporary cover in your yard. Hang a camouflage tarp over a couple of metal posts stuck in the ground, this too works wonderfully. Make sure you’re comfortable, though. Finding the perfect shot takes patience. If you have a long wait, you’ll want a chair to sit in to keep from getting cramped. Step 6. Check Your Equipment. Use basic, reliable camera equipment. You can spend a lot of money on fancy cameras and lenses, but they are not necessary. The three main things you need are a basic lens, a tripod, and a flash. The tripod will help you keep the camera still and pointed in the right direction while the flash can help lighten a dark picture and put a glint in the bird’s eye. Pre-focus your camera where you think the birds are crowing to land. Some birds stay for a only an instant, so you’ll need to snap the picture quickly. Video Bird photography can also be accomplished with the same idea in mind. Bird videos you make yourself will bring you hours of enjoyment watching your backyard birds from the comfort of your own living room. While you are away at work or if you don’t have time to watch your backyard birds in person, this is the perfect solution! Two Bird Cams are available from my store and I’ve provided two short videos so you can see what you can expect from each. Hawk Eye Nature Cam shoots black and white infrared images at night and color video by day. You can attach it to a tree, a feeder, or inside of a bird house and see your backyard birds like you have never seen them before. Video credit to YouTube’s Wildman50. Audubon Birdcam is a better quality camera (but also more expensive) however, as you will see it records images are clearer. This is the obvious solution for serious minded bird watchers. You can get the Audubon Birdcam by clicking here. Have fun and enjoy your bird photography! Elegance and grace define the Tree Swallow. With an iridescent coat of metallic blue-green, and underparts and cheeks of pearly white, it’s hard to find a more elegant looking bird. Grace comes naturally to this lovely swallow as it glides along with its distinctive, swooping flight. Left on their own, this bird nests in tree cavities and prefers a habitat near forests, hence it’s name. Listen for single chit or cheet notes. Durning breeding season, these birds also create a song out of happy, twittering notes. They are great at hunting mosquitoes and other airborne pests around your garden making them an attractive bird to attract to your yard. Build or buy nest boxes and attach them to trees in the back part of your yard away from where there is activity. Optimum opening size is 1 1/2″. Bluebird-style houses work just fine. 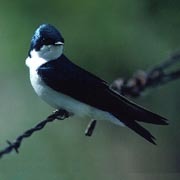 Expect Tree Swallows to dive and swoop at you if you get too close to their nesting territory. Unlike other species of swallows, the Tree Swallow eats berries and seeds as a part of their regular diet. Bayberry, dogwood, red cedar, Virginia creeper, and other berries and seeds comprise about 30 percent of their diet. Protect your hummingbirds with this transparent hummer hat that fits over your feeder providing shelter from sun and rain for the hummingbirds while offering you the ability to watch these wonderful little birds. 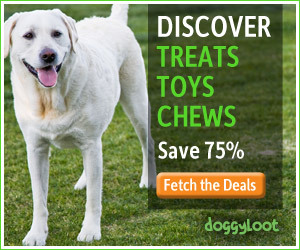 Keeps the squirrels at bay as well! The “Hummer Hat” is the best baffle made for protecting your hummingbird feeder from squirrels and the weather. Not only will it stop squirrels but it will also stop pigeons from roosting. The 17″ clear red dome will never block your view and it is made from 100% recycled Plexiglas. 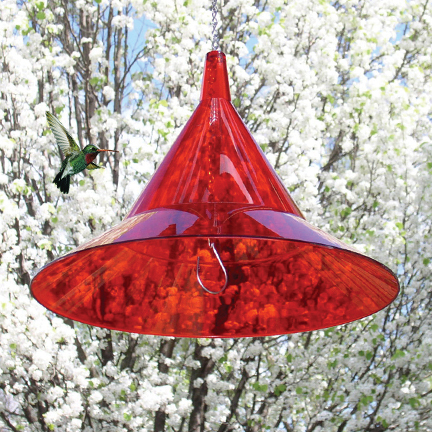 You’ll also love that it will increase the hummingbird activity around your feeder due to the bright red color which hummerbirds are so attracted to. Easy to hang and the hardware is included.